We get the same question every time we release a new proprietary GoldSilver product: why should I buy your silver round instead of a standard bullion product like an Eagle? There are several answers to that question—they can be a great way to diversify, they’re unique in the marketplace, and they might reflect values that you share. But the biggest answer of all is this: because you might make a bigger profit. That’s a bold statement, because like most things in life, there are no guarantees. But once you’ve got a meaningful stash of silver Eagles or Maples Leafs, a nagging question will start to tickle the back of your brain: do I just keep buying the same thing? At that point you realize that maybe you do want to diversify your physical holdings, or maybe you do find our rounds attractive, or maybe you would like a silver product with a message that is more meaningful than just an image of a dead leader or a bird. And yes, maybe you’d also like a shot at juicing your returns when you someday sell. The first criteria to look for is a coin or round that has a limited mintage. In other words, a product where its production was capped, either in number or by time. Limited mintage rounds can often take on additional premiums over time. So not only do premiums appreciate with the price of the metal, they sometimes increase much more due to their limited availability. Your investment can thus potentially grow faster than a mass-produced sovereign coin or private minted round. This answers the question of why we frequently limit the mintage of some of our products: we do it for you! Sovereign coins will almost always sell near the spot price. That’s one reason they should be a cornerstone investment for everyone’s portfolio: you have a good idea of what you’ll be paid when you sell. You take on very little risk—some would say no risk—when buying sovereign coins, other than what the spot price does. That’s what you want in a core investment of physical metal. So to add a little extra return to your portfolio, the first step is to look for silver rounds that have a limited mintage. It’s pretty straightforward: the more you pay upfront for an investment, the higher it must climb to reap a profit. The same concept holds true with collectible silver; if you overpay when you buy, the round must appreciate all that much more for you to lock in a gain when you sell. So how do you know if you’re overpaying? With silver, it’s simple: only buy rounds where the premium is similar or close to what you’d pay for a standard bullion product. Silver Eagles are a good barometer to use. If an Eagle goes for, say,20% over spot, look for rounds with a similar premium. Below that premium would be even better (again, as long as the other 2 criteria are met). The bottom line is that the more you pay over a silver Eagle premium, the lower your odds of someday selling for a bigger profit. 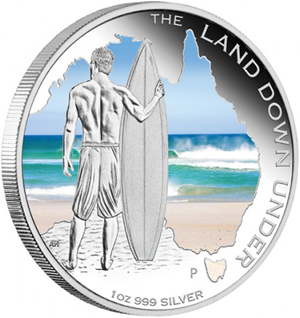 I love this surfer coin from Australia. Ain’t she pretty?. I think it’s a cool coin, and when I first saw it I was tempted to buy one to prop up on my desk and daydream about catching a big wave. The only problem is, that coin currently sells for 325% over spot! In fact, the asking price is above silver’s highest recorded price in history! The silver price would have to more than quadruple for me just to break even. That’s why I didn’t buy it. This is one reason we generally don't buy proof coins. At the time of this article, proof silver Eagles from the US Mint were selling at about 200% over spot. There could be exceptions, though… maybe you’re consciously seeking collectible value, or want to resell them on eBay in a few years, or give them as a gift more for their beauty than resale value. Generally, though, these types of coins are for true collectors—if you want to explore that field, read this article first. For investment purposes, look for silver items that sell at bullion pricing. Desirability is subjective, because as we all know, art to one person can be trash to another. Further, trends can change, so what’s desirable today may not be appealing tomorrow. First, we don’t mean a round that is “pretty”. Most rounds have a degree of attractiveness (though we admit some look like the artist had a few beers first). And we don’t mean what you personally find alluring. That surfer coin is appealing to me, but my wife just rolls her eyes. The trick is this: is the round desirable to the masses? Does it hold universal appeal? The answer is still a tad subjective, but you can still use it to screen out things that might have passed the first two criteria yet still won’t lead to a big profit. For example, do most silver investors like surfer coins? Probably not. My big wave coin fails not just because it has a very high premium, but also on lack of universal appeal. The reason you want broad appeal is simple: you’ll have more potential customers. And the greater number of potential buyers for your coin, the easier it will be to sell and the higher the premium might rise. If you have an obscure coin, you’ll likely have fewer buyers, and in some cases may have no buyers. You see a beautiful round that has an image of Machu Picchu engraved on it. You like it and so inquire to see if it passes the 3 criteria. You’re first told it has a limited mintage—check. You then see the price is near bullion premiums—check. You then examine the round a little closer and see that it is a commemorative piece put out by the 3rd Fraternal Order of Peruvian Expat Brothers of North America. Does this round have mass appeal? Probably not… the most interested buyers are likely only those in the 3rd Fraternal Order of Peruvian Expat Brothers of North America. It thus does not pass the test as a collectible silver round with a chance of greater premium appreciation. But What If We Get a Mania In Silver? Won’t all silver products rise in value? Any pure (.999% or finer) silver product should sell at or near the spot price (assuming you haven’t purchased something obscure). But this doesn’t negate the criteria above. If the product you resell has a limited mintage and is highly desirable, and you paid near spot for it, you stand to make more than what a standard bullion product would pay. This is the entire basis of buying collectible silver. There’s no guarantee, but regardless how high silver prices may go, collectible silver rounds may fetch even higher premiums, if these 3 criteria are met. Disney coins… Star Trek rounds… even ones that mimic sovereign coins—they’re all subject to these criteria when it comes to determining future premium value. Buy one if you really want one, but understand that if it fails to pass any of these criteria it may not be an investment in collectible silver and wouldn’t earn an extra premium. On the other hand, look how some of GoldSilver’s collectible silver rounds have already grown in value, since they meet all 3 criteria. This data from eBay shows how much additional premium the prior years of our “Modern Ancients” series are fetching. All three of these GoldSilver rounds had 1) limited mintage, 2) bullion pricing, and 3) strong desirability. In a relatively short period of time, their resale value has surpassed that of Eagles and Maples Leafs. In addition to being very attractive, many investors like the messaging that is part of the Modern Ancients series. The shield on the GoldSilver products contains a powerful motto, one that highlights Mike Maloney’s belief system. Check out the GoldSilver mission statement and see if it holds appeal to you, too. There are no guarantee you’ll achieve similar premiums when you sell, but you can see that even during a flat market, Modern Ancients are already fetching higher returns. One thing I love about GoldSilver is that we’re big enough to create our own line of products. If you’re ready to diversify your holdings, or want own a unique silver round found nowhere else in the market, or want a shot at some extra dinero someday, our latest Modern Ancients release is a great place start.